Honestly, I’m surprised I had room for breakfast after eating all the toast at Merchant on our last full day in Madison. As we walked to breakfast, rubbing the sleep and mild hangovers out of our eyes, Shane teased me about the stack of toast which somehow grew from 3-4 slices of crusty farmhouse bread to a stack of toasts all the way up to the ceiling that I consumed Cookie Monster style. I don’t deny that I ate all the toasts. Just not that many. We’ve traveled a lot this year, and as a result, have spent a lot of time trying to figure out how to interpret Yelp reviews in order to find good coffee. The problem is that definitions of ‘good coffee’ are highly subjective: for some, it’s a 32 oz sugar spectacle from Starbucks; for others, it’s Blue Bottle. The best strategies I’ve found so far involve searching for words like crema, siphon, flat white, ristretto or gibraltar – one of which led us to Bradbury’s. 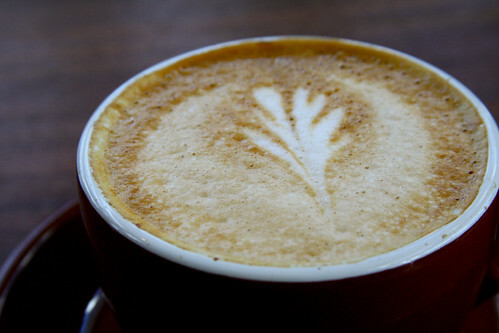 And Bradbury’s was exactly what we were hoping to find: seriously good coffee made by people who care. Shane had a traditional cappuccino – no more than 8oz, perfect microfoam – and a crepe with Nutella and bananas. I had a piccolo – indistinguishable from a gibraltar or a cortado, but then what do I know – and a scone. We left caffeinated and happy, wishing we’d found Bradbury’s earlier in our stay. After breakfast, we wandered around the Capitol Square to Fromagination, a cheeseshop on par with Cowgirl Creamery in my book. 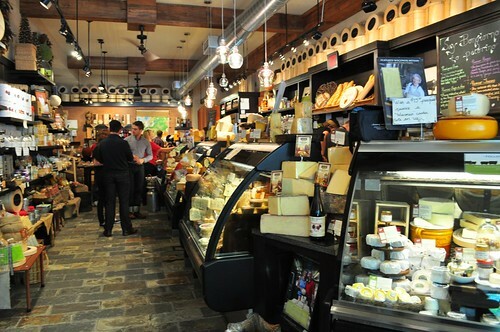 The store was in a state of minor disarray as a Food Network crew was in the process of filming a spot for a new show focused on cheese, but that didn’t deter us from sampling a number of fancy and delicious Wisconsin cheeses. I especially enjoyed the display of local beers and recommended cheese pairings, and wish we’d had the opportunity to try more of them! Regardless, we left with our dinner in hand – three different cheeses to be paired with co-op takeout – and a recommendation to check out the National Mustard Museum on our way out of town. We split a delicious lunch at Brasserie V, located near Camp Randall Stadium amongst a bunch of boutiques on Monroe St. Shane was excited about the Belgian beer list, but I was more into the cool and creamy pea soup that we shared for lunch, along with a half Croque Monsieur and a towering cone of frites. We tried to avert our eyes as a couple at the bar gratuitously made out between sips of their Kwak, served in authentic Kwak glasses. We wished we had more appetite so that we could eat and drink more delicious things. Off to New Glarus! 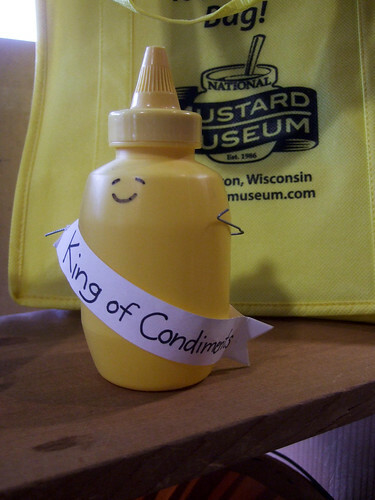 But first, a stop at the Mustard Museum, which was everything we hoped it would be: weird, esoteric, and full of ridiculous mustard things. What possesses one to make mustard – collecting, not making – one’s life’s work? A question for the ages. Historically we too have had massive trouble using Yelp reviews to find decent coffee. Part of that is not only the varying definitions of what makes good coffee from bad. The other part is that many Yelp reviewers don’t even rate the coffee at all — typically becoming preoccupied and enamored with things like vegan baked goods, accessibility of electrical outlets, or cute baristas before they would even consider the coffee quality. It’s so bad, it’s made us question whether no information is better than the junk Yelp heaps on us. 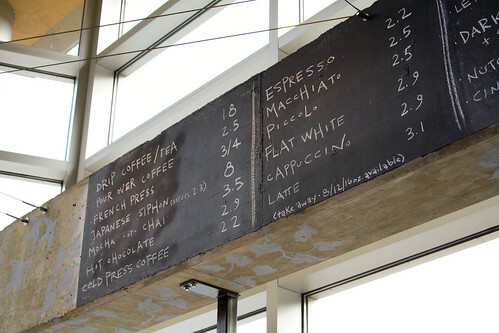 Your tactic of keying off of terms such as crema, siphon, flat white, and ristretto is a good one, however. Ironically, it also seems to emulate some of the research behind discriminating real reviews from fake ones. Sounds like you had a delicious trip to Madison! We’re so happy you enjoyed the Croque, pea soup and Frites – all our favorites. 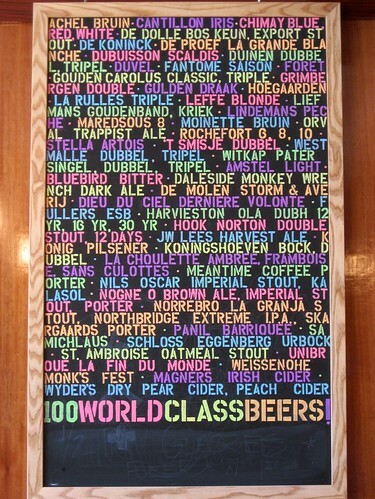 We hope you’ll have a chance to come back and sample more beer! !